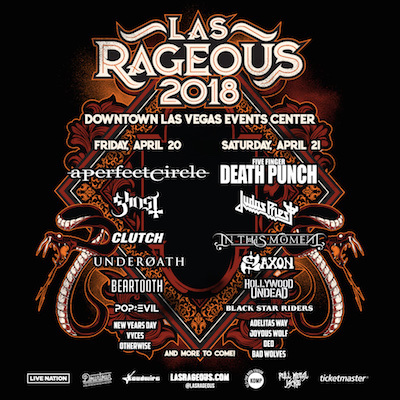 Sin City's premier rock and metal festival, Las Rageous, has released an updated performance lineup with the addition of hometown heroes Otherwise, along with goth-rock royalty New Years Day. Coming to the Downtown Las Vegas Events Center for its highly anticipated second year on Friday, April 20 and Saturday, April 21, the Live Nation-created music festival will take over two square blocks, in the heart of iconic downtown Las Vegas. Otherwise and New Years Day join an already exciting lineup of rock and metal icons and impressive newcomers. Festivalgoers can expect to hear fan favorites and possibly new music from Sin City mainstay and Saturday night headliner Five Finger Death Punch (who recently released their greatest hits album, A Decade Of Destruction), and an eclectic set from A Perfect Circle that may include their brand new song, "Disillusioned." Additionally, fans hope to hear new tracks from NWOBHM staple Judas Priest, legendary hard rock group Clutch, Pop Evil and Saxon, who all have albums set for release in the coming months. There will be memorable spectacles from In This Moment and Ghost; killer performances from Black Star Riders (featuring members of Thin Lizzy), masked rap rock kings Hollywood Undead, and DED, who just released a music video for their new single "Hate Me"; along with music from metalcore heavyweights Underoath and Beartooth, Los Angeles breakouts VYCES and Bad Wolves, up-and-coming blues-rockers Joyous Wolf, and Vegas's own Adelitas Way. A Perfect Circle, Ghost, Clutch, Underoath, Beartooth, Pop Evil, New Years Day, VYCES, and Otherwise, with more to come. Five Finger Death Punch, Judas Priest, In This Moment, Saxon, Hollywood Undead, Black Star Riders, Adelitas Way, Joyous Wolf, DED, and Bad Wolves, with more to come. 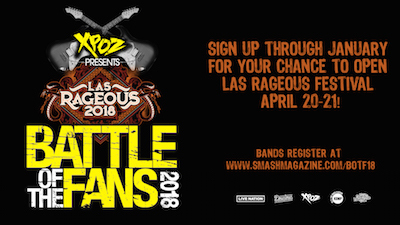 With only 10,000 tickets available for purchase, Las Rageous offers the rare opportunity for fans to enjoy a festival experience in an intimate outdoor setting. Located just off Las Vegas Boulevard at Third and Carson Streets, Las Rageous will take over two city blocks of the historic downtown area. All ages are welcome and doors open at 4:00 p.m., with headliners taking the stage at approximately 10:00 p.m.
All tickets available for purchase are 2-day festival tickets for both Friday and Saturday. Two day festival tickets are currently available for $127 (plus fees). VIP tickets are also available starting at $366 (plus fees), and include private viewing from a platform and onsite parking. Live Nation Entertainment (NYSE: LYV) is the world's leading live entertainment company comprised of global market leaders: Ticketmaster, Live Nation & House of Blues Concerts, LN Media and Artist Nation Management. Live Nation Las Vegas produces residency shows from Jennifer Lopez, Lionel Richie, Backstreet Boys and Pitbull at The AXIS at Planet Hollywood Resort & Casino; Bruno Mars and Ricky Martin at the Park Theater at Monte Carlo; and Il Divo, Rascal Flatts, Styx & Don Felder, Chicago, ZZ TOP and Earth, Wind & Fire at The Venetian Las Vegas. Live Nation Las Vegas also brings other world-famous artists to many of the city's other premiere concert venues including T-Mobile Arena, Mandalay Bay Events Center, MGM Grand Garden Arena, Las Vegas Village, Pearl Concert Theater at the Palms, House of Blues, Downtown Las Vegas Events Center, The Joint at Hard Rock Hotel & Casino Las Vegas, and more. For additional information, visit www.livenation.com. Find Live Nation Las Vegas on Facebook, Instagram and follow us on Twitter. Located at the corner of Third St. and Carson Ave. across from the D Las Vegas, the Downtown Las Vegas Events Center can accommodate up to 11,000 guests and features state-of-the-art stage, sound and lighting. The open-air design is inviting to both tourists and locals and offers the perfect spot for concerts, conventions and other large-scale events. Embracing the uninhibited spirit of Downtown Las Vegas, the new venue plays host to a line-up of curated events including premier concerts, food festivals and more. The venue is also the first entertainment arena in Las Vegas to accept Bitcoin as currency. For more information, visit www.dlvec.com or follow on Facebook, Instagram and Twitter at @DLVEC.